About 12 years ago onP1010005e of my sisters discovered the beautiful and rather isolated village of Applecross in the NW Scottish highlands. Since that initial visit, Applecross has become an annual holiday destination for 3 generations of our family. We all enjoy the glorious scenery and the peacefulness of the area. 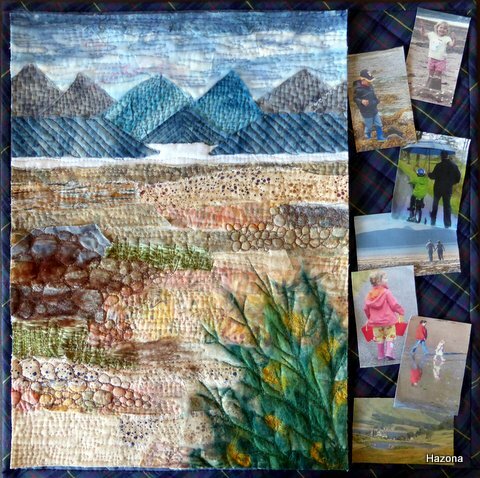 My small quilt shows the view from Applecross over to the Isle of Skye. Just looking at this picture brings back lovely memories of our holidays there – as do the small “postcard” prints of family members enjoying themselves. 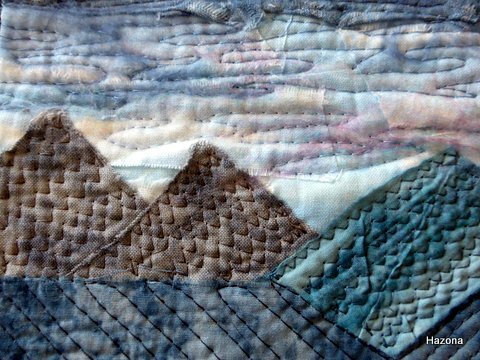 The large picture is constructed as a collage then machine stitched for detail. The small pictures are my own photos printed onto cotton. Helen, you must tell me more about this place! My father’s family came from Kilsyth…and my cousin James now lives on Skye. I plan to visit him in 2017 (for my 65th birthday)…so I would like to know about and perhaps see this very place. Thanks for the introduction!! 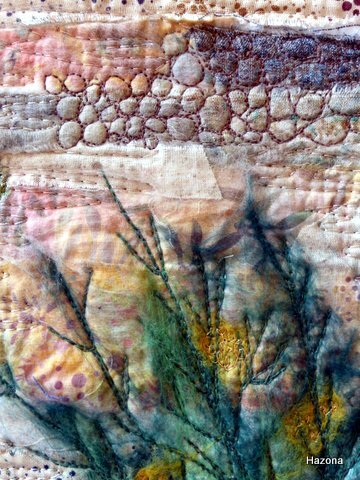 Lots of lovely texture there Helen. Memories of happy holidays are very special.